Submitted by Sapient on August 2, 2012 - 8:17am. 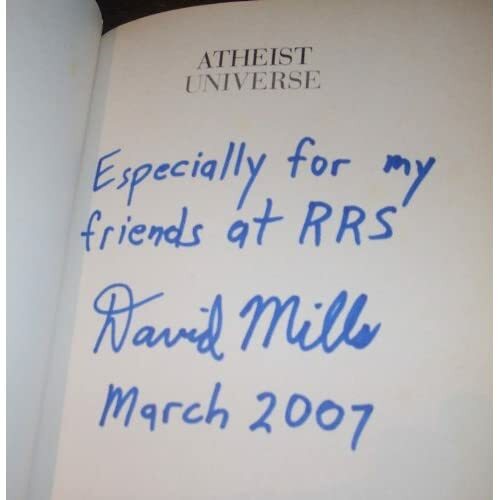 In an attempt to raise money to help cover costs associated with our network of atheist sites I have decided to sell some of my personal collection of autographed books and items. Everything is priced very fairly compared to other similar items on Ebay. Thanks for looking, and thanks for any purchases you make. 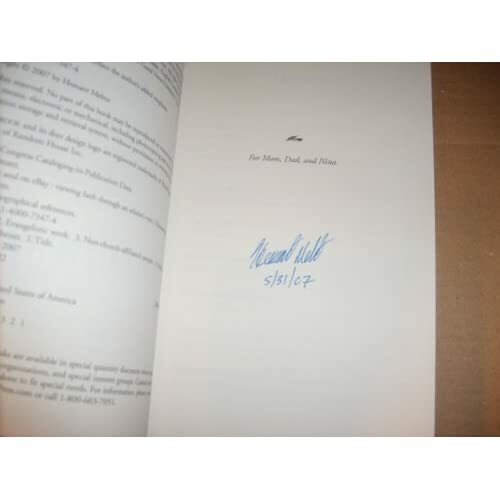 Most of the items were signed in my presence. If they were not, they were sent to me directly by the person who signed. 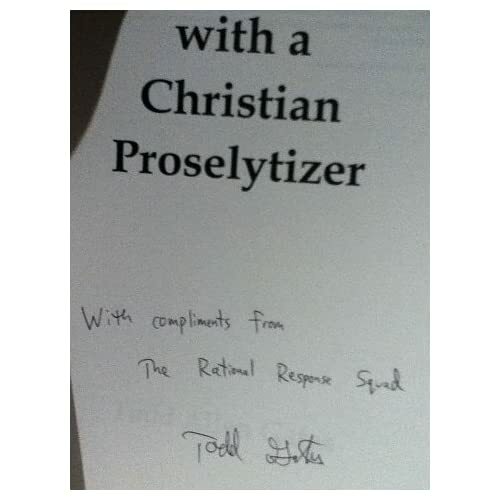 This is a great way for you to donate to RRS and the upcoming Atheism United and get something back for your donation. Other atheist books are available at our Amazon store. All items are currently at Amazon warehouse and will be fulfilled and handled by Amazon's excellent customer service. Submitted by Sapient on August 26, 2012 - 2:28pm. Thanks to those who made purchases. I have updated the first post to reflect the items that are no longer available. Check out the rest of the inventory all to be fulfilled by Amazon here. Submitted by Sapient on January 2, 2014 - 12:54pm. I just dramatically reduced the pricing on everything. I'm about to be charged a long term storage fee by Amazon as these items have been there for a year or more. So I slashed the pricing and am hoping you folks grab something in the next few weeks so I can avoid the fee. LINK TO MY AMAZON STORE. Submitted by Sapient on January 2, 2014 - 1:20pm. Here you can see that I'm just barely going to make a profit. 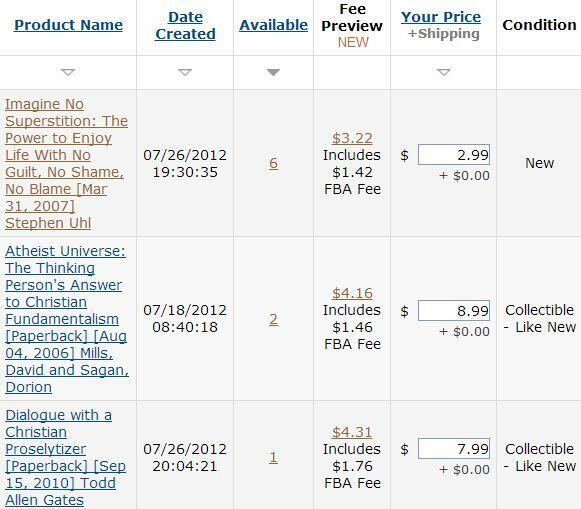 If these items sit past Feb 1, I'll surely end up paying out of pocket, just to sell these awesome atheist items. Submitted by Jeffrick on January 2, 2014 - 2:30pm. Trust what you see and don't ask questions. Submitted by iwbiek on January 2, 2014 - 3:53pm. the link just takes me to "help and customer service." Submitted by iwbiek on January 2, 2014 - 3:54pm. Submitted by Sapient on January 2, 2014 - 5:23pm. Hopefully my post above is fixed now and this is a working link too. Submitted by Sapient on January 2, 2014 - 5:24pm. Submitted by Sapient on January 2, 2014 - 5:30pm. 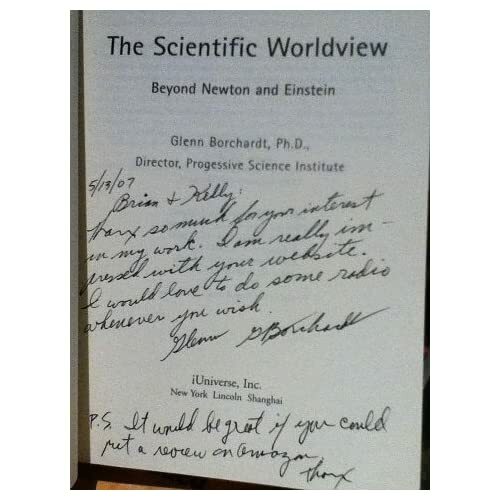 click "popular atheist books" in my signature. Submitted by Vastet on January 2, 2014 - 5:46pm. If I had ANY money I'd buy some just to help. But I'm living on about $250 a month right now.